This Friday, director John R. Leonetti‘s much-hyped teen horror movie Wish Upon opens, and while the film is a fine distraction (look for our review on Thursday), it’s vital to remind readers — and alert our younger readers — to the fact that movie is really just another riff on what is perhaps the most terrifying and influential short story in the history of the English language: Author WW. 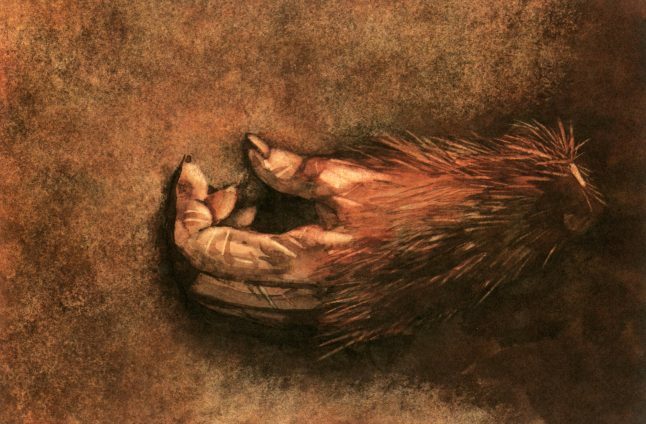 Jacobs’ The Monkey’s Paw. Penned in 1902 by Jacobs (who was best known as a humorist), the compact morality tale packed a wallop then and still has the power to freeze the blood, despite a myriad entertainments liberally borrowing from it for almost a century. In it, retired couple Mr. and Mrs. White, living in the English countryside with their now-grown son, Herbert, are visited one night by Mr. White’s Army friends, Sergeant-Major Morris, who had previously been stationed in India. Sitting by fireside, Morris tells his old friend the tale of a severed simian paw, acquired by an Indian mystic, that apparently has the power to grant, whoever grabs it, three wishes. Mr. and Mrs. White are intrigued by the presumably-exaggerated story, despite Morris’ warnings that each wish comes packed with a lethal karmic consequence. When Morris throws the cursed appendage into the fire, Mr. White retrieves it and Morris takes his leave, warning his friend that to exploit the paw’s power would be deadly. And of course, Morris is right. First, Mr. White wishes for a large sum of money and he gets it. Problem is, the windfall comes after the White’s beloved son is killed in a machinery accident and his employer offers the money as a settlement. Decimated by grief, a week later, the couple wish for their boy to be alive once more, an act that the father immediately regrets when he considers that his son’s body, mutilated by the machine, will be in a monstrous shape when he/it returns. Mrs. White doesn’t care and when she hears a pounding on the door, she runs to let her dead — now undead — son in. Mr. White races for the paw, makes his final wish and when his wife opens the door, there is nothing but the cold night wind to greet her. The Monkey’s Paw disturbs almost entirely by implication. We never see Herbert minced in a machine. We imagine how horrible and bloody and painful a death it must have been, however, and we’re locked emotionally with his parents, the father of which has had to identify the body and is even more scarred by the trauma than his suffering wife. And as the tension mounts in the pulse-pounding climax, we’re preparing for the worst and we’re cheated. But what could be worse, really, than the beyond-all-reason misery of that mother? To lose her son — especially by her own casual doing — and then to be teased with undoing that action only to have that shimmer of hope denied? Truly horrifying and masterfully constructed by the author. Almost immediately, The Monkey’s Paw sparked imaginations and was adapted by other artists looking to emulate its impact, with a series of stage plays, a troika of early film adaptations (including a 1933 Wesley Ruggles feature from RKO that was long considered lost and only recently surfaced in a French dubbed print), radio plays, audio dramas (our fave is read by actor Victor Garber) and eventually, television adaptions and even an Opera. And every time that tale was told, no matter the quality of the production, nothing could quite capture — or dilute — the elemental power of Jacobs’ text. Even The Simpsons riffed on the tale, with humorous results. The Monkey’s Paw‘s presence is present in many key horror entertainments, Wish Upon being only the latest in a long line of them. Freddie Francis’ 1972 Tales from the Crypt featured a memorable version of The Monkey’s Paw, itself adapted from one of the stories in the infamous same-named EC comics’ book, in which a dead man is wished back to life and then screams in agony due to the fact that he had been embalmed before death! And of course, the most famous expansion of Jacobs’ story came in the form of Stephen King’s novel and later film adaptation, Pet Sematary, in which a man, so racked with grief at the accidental death of his toddler son, buries him in a cursed burial ground. And when the child returns from the dead… well, he ain’t the same kid. At all.